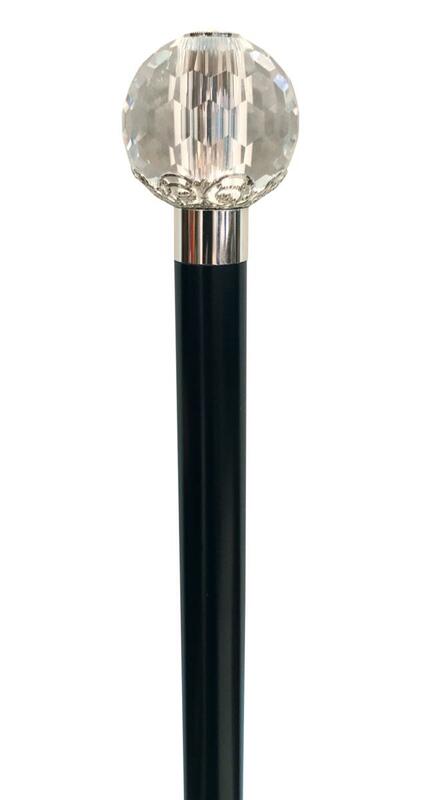 An extremely eye-catching formal cane suitable for use on the most glamorous occasions. 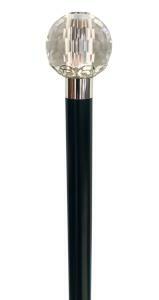 The large, multi-faceted crystal sits in a silver coloured metal mount atop a tapered, black wooden shaft, fitted with a discreet, non-slip rubber ferrule. The crystal is secured to the cane with an elegant metal fixing that runs through the centre of the crystal and is topped with a second crystal inset in the top of the cane. The light bounces beautifully off the handle, making this a fascinating object to own. Overall height 92cm. Ferrle size 19mm. Item weight 390g.